Hitherfield Primary School on Leigham Vale is an amazing Lambeth primary school. What adds to its amazingness, is its wonderful Edible Playground. It was created in 2014 with support from Trees for Cities, the school, the children and the parents. The growing area is full of espalier apple trees and a beautifully designed arrangement of raised beds to facilitate a really good learning environment for large to small groups of children. There are also many soft fruit bushes and plants, along with herbs and flowers in the borders. 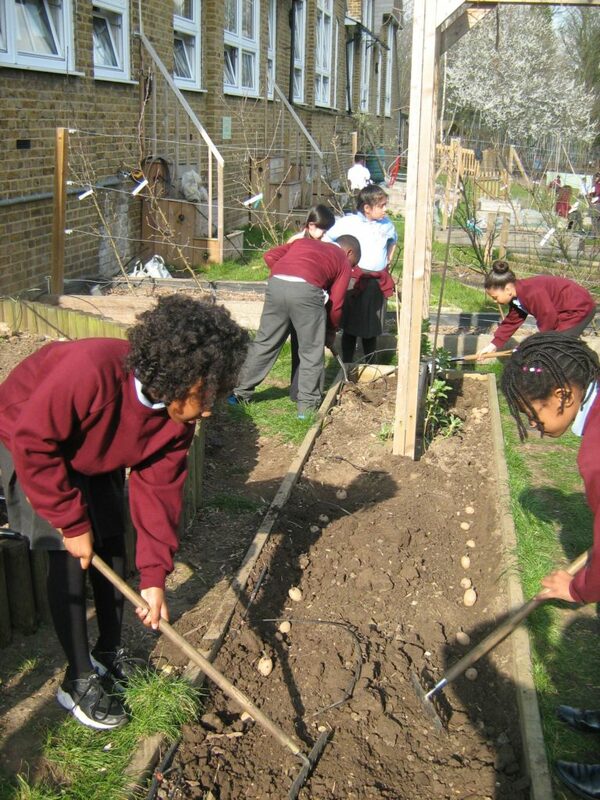 Over 150 children get to take part in gardening activities every week, and over the year each child in the school will have a terms access to outdoor lessons in the garden. It is a really inspiring place for many of the children who do not have access to gardens at home, and it allows them to get stuck in, from digging (always a great favourite) to hoeing, sowing, weeding, planting on and watering. The garden is also a magical place for children to observe the seasons, and the mini beasts that live there, especially a large lady bird population. Some beautiful art work has also been created in the garden, and every year there is a Who can grow the Biggest Sunflower Competition amongst the classes. The children are able to try the harvest on site, sometimes take it home, and it is given to the kitchen for the school dinners, cooked on site. There is also a greenhouse to enable early sowing, and a further resource to enable the children to learn about food growing. Hitherfield Edible Playground is a real gem, and incredibly well loved by the school community. I just hope the new chickens don’t eat everything !!! !